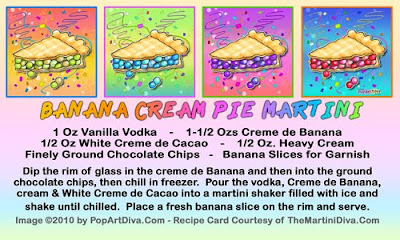 This Banana Martini tastes just like a liquid banana pie - it's creamy and brimming with banana flavor. It's a perfect dessert martini and a lot easier than baking an actual banana cream pie. Have some fun - create a Banana Themed Martini Party. Just grab some yellow cocktail napkins and plates, do up some of my Banana Bacon Rumaki and Banana Chicken Fritters from The Diva of Tiny Foods and your party will be truly bananas!